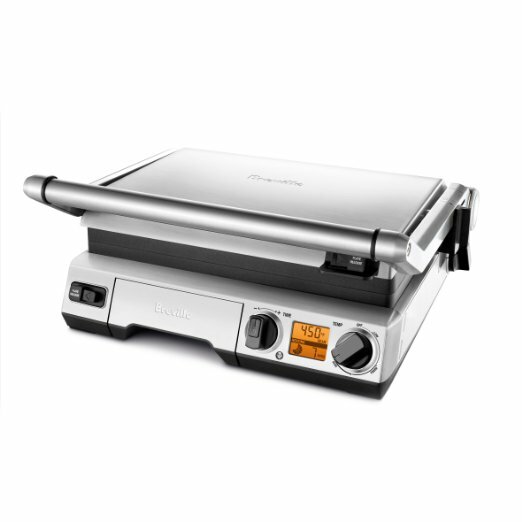 Grill lovers will fall in love with this Breville smart grill. Its unique element IQ technology shortens the gap between outdoor and indoor grills. The grill plates of this tabletop electric grill are embedded with heat sensors. When you put a cold or frozen food on the grill, it detects the heat drop and immediately turn up the heat. You will be able to cook your food fast. The 1800-watt embedded heating design will give your food the highest temperature. You can sear meat at a consistent temperature. 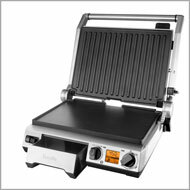 It opens all the way flat so that you can use it as a griddle and a grill surface at a time. It gives you six adjustable height setting. So you can decide how much force you are putting in your meat. All these features work out beautifully. This Breville smart grill is worth purchasing. The most attractive feature of this Breville smart grill is the element IQ technology. It detects the sudden heat loss of cold food and rapidly recovers that temperature. So your meal starts to cook just after it is put on the grill. Most grills don’t reach the temperature to cook your food like an outdoor grill. This inside grill heats up to 450 degrees Fahrenheit which is the perfect temperature for searing or cooking steak. Another product of Hamilton Beach will give you 500 degrees Fahrenheit. This Breville ﻿indoor﻿ grill has six adjustable height settings. You will be able to adjust the height depending on the thickness of your food. The combination of this adjustable height and temperature will let you cook the way you want to. The grill comes with one flat plate and one ribbed plate. So you can use it both as a grill or a griddle. The cooking surface (260 square inches when opened all the way flat) is big enough to cook two steaks at a time. It is perfect for a 4-5 person family.If you want a smaller grill, then go for Hamilton Beach 25331. It cooks really fast because of the IQ technology and embedded heating design. It takes a short time to pre-heat and you can cook a chicken between 10 minutes. 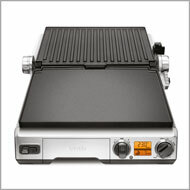 This tabletop electric grill is well known for all the unique features and for the bbq taste. With every cooking, there is a cleaning up part afterwards. You don’t have an option. So Breville smart grill made tried to make the work as easy as possible. The plates are removable. After cooling down, you just take the plates and put it in your dishwasher. That’s all you have to do. But some prefers not to use a dishwasher. Well, then you can clean them by a wet towel and wash them with soap. It is easy to clean because most of the grease will store at the drip tray. Your kitchen will be less messy. Before cooking anything, preheat the inside grill first. It will let you know when it is ready to cook. You will have the traditional grill mark with the grill plate. If you want to have it in both sides then you will have to flip the food in half way of cooking. You will get a good experience cooking with Breville Smart Grill. The price of this indoor electric grill is double than the average price of an indoor grill. But do you get these unique features in them? That’s the difference between the less expensive ones. You will get what you are paying for. It will not disappoint you. 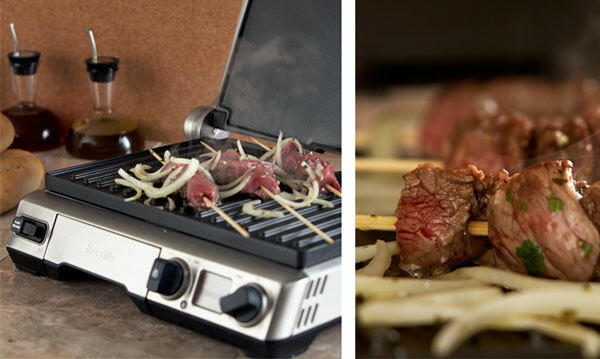 This tabletop electric grill is worth buying. 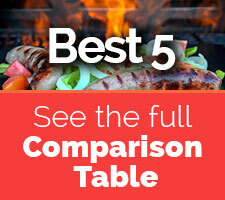 No other indoor electric grill will give you the IQ technology or the embedded heating design. Again the grill is very smartly designed and the parts are very strong. It will give you the pleasure of cooking foods in another level. It is the one of the most unique indoor grill among the best grills. You are getting so many features in one indoor electric grill. The adjustable temperature and adjustable height are built so smartly, you will not get confused while cooking. There is also a digital display for the temperature and timer. The parts are well built and removable. But they give only one griddle plate and one grill plate. So you might have to buy two more plates if you want to use same plates at a time. The cleanup also very easy. 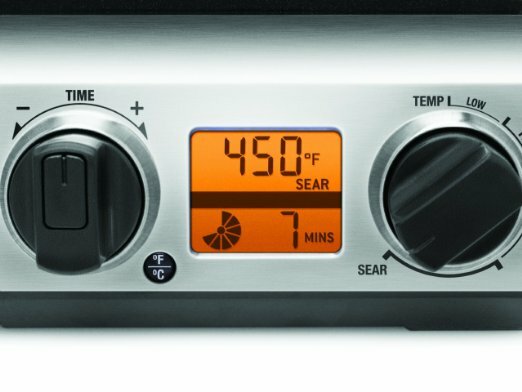 The unique IQ technology and embedded heating design will give you the best taste as well as fast cooking. This product is very expensive in comparison with other grills. 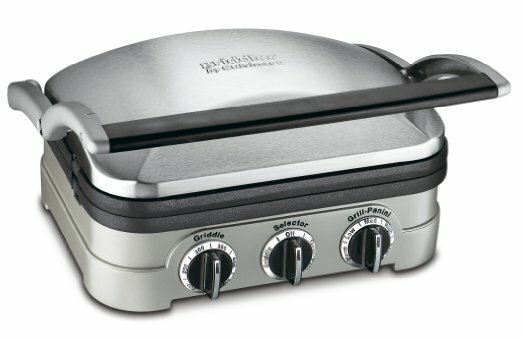 If you want a cheaper grill with unique features like Breville, then you can go for T-Fal GC702D OptiGrill.